Ordained 29 June 1951. Elected Archbishop of Munich, 24 March 1977. Made a cardinal by Pope Paul VI, 27 June 1977. In 1981, Ratzinger was named Prefect of the Congregation for the Doctrine of the Faith, the organization which until 1965 had been called the Holy Office of the Inquisition, making him successor to the Grand Inquisitor. A prominent and learned theologian within the church, his chief role as Prefect was to produce the church's official interpretation of scripture; as such, he is seen as more conservative within the church, especially when compared with the more "liberal" Pope John Paul II -- again, liberal within the context of the Catholic church. Even so, Ratzinger was considered a likely successor to the papacy during Pope John Paul II's declining years. Despite mild contention in that pope's last days from Nigerian cardinal Francis Arinze and Cláudio Hummes of São Paulo, Ratzinger was elected quickly after only two rounds of voting -- hardly 24 hours after the conclave of cardinals first convened. 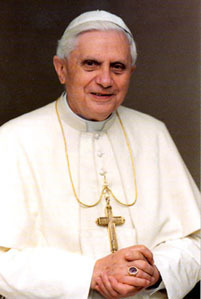 He was officially elected Pope on 19 April 2005, choosing the name Benedict XVI. He succeeds in name Pope Benedict XV, pontiff from 1914-22, and in nationality Pope Victor II, pontiff from 1055-57, making him the first German pope in nearly a thousand years. There is predictably some concern over Ratzinger's health, given that he was 78 at the time of his election -- compare Pope John Paul II, who became pope at 58. In September 1991, Ratzinger suffered a hemorrhagic stroke. In August 1992, while vacationing in the Alps, he fell and struck his head against a radiator. Neither incident left any lasting damage. Ratzinger is also the oldest newly-elected pope since Pope Clement XII, who was elected pontiff in 1730 at the age of 78, dying ten years later. At the time of his election, Ratzinger admitted that he anticipates having a short reign. "How many winds of doctrine we have known in recent decades, how many ideological currents, how many ways of thinking... The small boat of thought of many Christians has often been tossed about by these waves – thrown from one extreme to the other: from Marxism to liberalism, even to libertinism; from collectivism to radical individualism; from atheism to a vague religious mysticism; from agnosticism to syncretism, and so forth. Every day new sects are created and what Saint Paul says about human trickery comes true, with cunning which tries to draw those into error. Having a clear faith, based on the Creed of the Church, is often labeled today as a fundamentalism. Whereas, relativism, which is letting oneself be tossed and 'swept along by every wind of teaching', looks like the only attitude (acceptable) to today's standards. We are moving towards a dictatorship of relativism which does not recognize anything as for certain and which has as its highest goal one's own ego and one's own desires." In the years before World War II, Joseph Ratzinger's father worked as a member of the Bavarian state police force. An anti-Nazi, the elder Ratzinger retired with his family to Berchtesgaden in 1937. The following year, membership in the the Hitler Youth was made compulsory, but young Joseph Ratzinger would not join until he was 14, in 1941. He was enlisted as a telephone operator in the German Army in 1943, but deserted in April 1944 while stationed in Hungary. Neither he nor his father ever joined the Nazi party.